Ever known a band whose fan base is much smaller than you think a group with their level of talent deserves? As a fan of a rather niche genre of music, you probably have. Well, my co-writer John Thornburgh and I are definitely in agreement: the French four-piece Markize is one of those bands. Though they made a bit of a buzz with their 2007 debut Transparence, the band has fallen a bit off the grid in the last few years. Now the band is back with their sophomore full-length A Perfect Lie, whose release they celebrated with a show at a small Paris venue by the name of Le Zebre. Now, this place is pretty damn small, and I’d hazard that there were about 150 people (at most) in attendance that night, which is both a good and bad thing: good because those who did come got to witness a really intimate show and presentation of the new album and had the chance to exchange a few words with the band; bad because, well, you’d think a band would’ve garnered more of a following in their hometown over the years, especially since they’ve been around for the better part of a decade. After a frankly un-memorable opening band (whose name I don’t even remember, if I ever knew it at all), the small crowd began to buzz as Markize’s intro started playing. 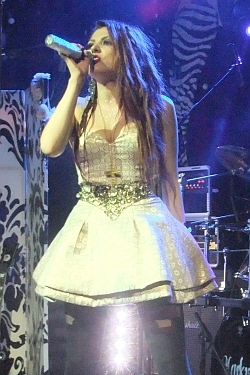 The band took their places on stage, with vocalist Alina Dunaevskaya coming out last to cheers from the audience. Though the stage was small, Markize managed to put on a dynamic show (props to Alina for being able to walk around the stage at all in those thin stilettos she was wearing!). But of course, as it was my first time seeing this band, it was nice to hear them play some of their older songs, such as “Mon Ange” and “Poussière de Vie,” but what really took me by surprise was that they end the set with a mash-up of Lady Gaga’s “Bad Romance” and Muse’s “Time is Running Out” that got the crowd really excited. It was the perfect way to close the show, and the band left to cheers from the audience and with smiles on their faces. To end the night, Markize’s bassist Julian De Feyssal and his other band, the 80’s cover band Showtime, took the stage and entertained the crowd with their renditions of classics from Scorpions, Twisted Sister, and plenty of others, turning the show into a real party. Afterwards, Markize was around to chat and sign albums for all the fans who came to the show. I even got the chance to talk to Alina’s mother, who told me there was a troupe of girls from Alina’s fan club who came all the way from Moscow to see the show! Now that’s dedication. All I can hope is that more people will come to realize how great Markize really is and that the new album inspires more people to show their support for this amazing band.